I didn't realize there was something that already did this, I did actually look for one first. I guess I should have asked someone. Oh well. @QuadroTony Do what Randactyl suggested. 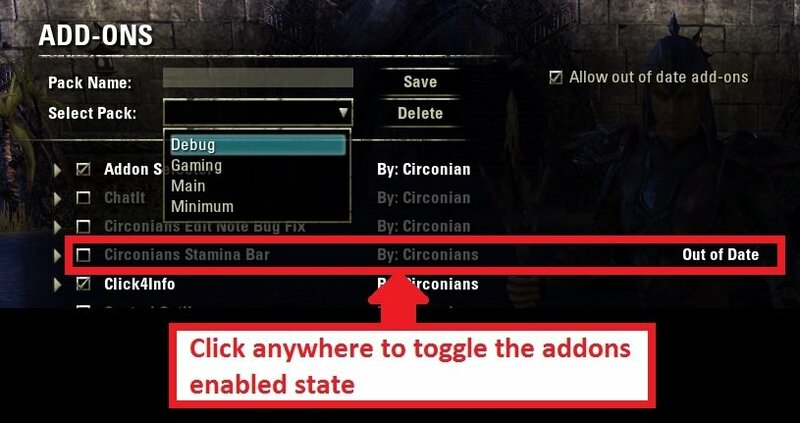 Leave both addons turned on, load your saved settings from Addon Profiles, then just type a name in the Addon Selector "Pack Name" box & click save. Do it for each profile you have saved in Addon Profiles. Last edited by circonian : 08/01/15 at 03:23 PM. Hm. That would actually be very easy to do, but to do what you ask automatically it would load into the zone, then this addon would recognize the area, change the settings, & immediately reload the UI & you would have to wait again for it to reload a second time. I'm not sure people would like that...although I guess they don't have to turn the feature on. Last edited by circonian : 08/01/15 at 03:24 PM. I was a huge fan of AddonProfile the first and asked the community for someone to continue it when its author left (thank you, Merlight!). This one looks great. I tried it yesterday and it's very easy to use. I liked the AddonProfile keybinding feature, but it never works perfectly fine (it blends profiles, so it is useless). Do you think it would be possible to add keybinding to yours? Last edited by Kwisatz : 08/02/15 at 07:11 AM. True, it auto loading after zoning would annoy a lot of players, maybe a tiny dialogue popup with reload ui and skip buttons as an optional feature. Last edited by QuadroTony : 08/03/15 at 12:57 AM. I have the same problem, both the first version and the update don't show up in Minion. I sent a PM to Cairenn to ask why its not showing up in minion, I have no idea. Waiting for a response. Last edited by circonian : 08/04/15 at 06:49 PM. I can confirm that minion now finds the addon.